Make adorable Christmas angel crafts that will last a lifetime! Angels are iconic figures in the Christmas story, so it's no surprise they have inspired crafters all over the world. 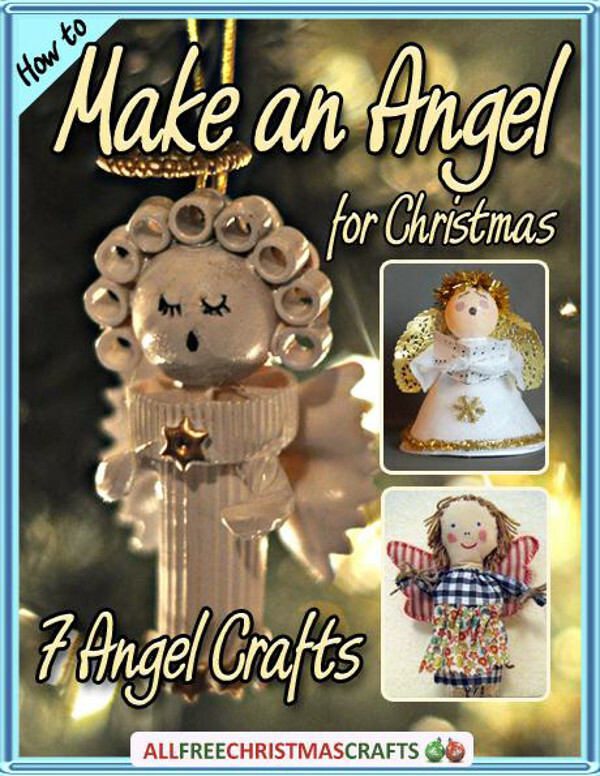 Find your own inspiration with our collection, How to Make an Angel for Christmas: 7 Angel Crafts. You'll be amazed at the unique qualities of all the Christmas angel crafts in this collection. With the gorgeous Christmas decorations gathered in this eBook, you'll be able to deck your whole house in these heavenly messengers. No matter what your skill level or age, there are plenty of homemade Christmas decorations in this book for you. 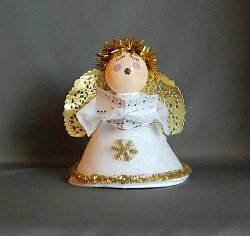 You can experiment with your favorite fabrics and embellishments to make each angel shine. These Christmas angel crafts will sparkle on your tree and add warmth to your Christmas home decor. Visitors who enter your home will smile once they see the elegant and adorable Christmas angel crafts that are there to greet them. Bring Christmas cheer to your home with one of the projects in How to Make an Angel for Christmas: 7 Angel Crafts. Download your free copy of How to Make an Angel for Christmas: 7 Angel Crafts today! Christmastime is a joyous part of the year that includes both faith and festivities. One of the most beautiful images associated with these themes is the angel. Angels come in all shapes and sizes, and they look beautiful on a Christmas tree, mantel, and everywhere in between. Get into the Christmas spirit by learning to make an angel from craft materials you have on hand. Best of all, these Christmas angel crafts are fun for all ages and can be displayed your home year after year. We’ve gathered Christmas angel crafts from some of our top bloggers, so you’ll not only receive the best instructions and images but amazing results. You don’t have to spend money to have quality Christmas angel crafts, so save money this year with the projects in our How to Make an Angel for Christmas: 7 Angel Crafts. You can find more tutorials, tips, and crafts at AllFreeChristmasCrafts.com. Our eBooks, like all our Christmas craft projects, are absolutely FREE to members of our crafting community. Please feel free to share with family and friends and ask them to sign up at our website for our free e-mail newsletter. 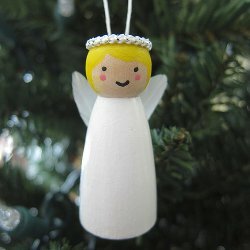 Little Wooden Angel Ornament (pg. 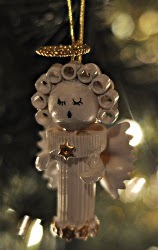 28) – For an adorable, old-fashioned Christmas angel craft, you can't go wrong with this Little Wooden Angel Ornament. Because you use paint to decorate the angel, you can make your ornament as traditional (white and gold) or as colorful (red and green) as you'd like. Add your own embellishments, like a tiny halo of beads, to make this DIY angel stand out. Pasta Angel Ornament (pg. 21) – This Christmas angel craft is a reader favorite. Everyone seems to love homemade Christmas ornaments like this one. Pasta angel ornaments are the ultimate solution for thrifty crafters who want to make cute homemade Christmas ornaments without emptying their wallets. You may already have all of the materials you'll need on hand. If you want to make this project even more fun, get the kids involved. Little ones love making Christmas ornaments, and you can watch their faces light up when they hang their ornaments on the tree. Lace Angels (pg. 5) – Lace and angels are a match made in heaven. After all, nothing gets across the delicate, light look of an angel quite like lace. You can use lace to create decorations, wearables, ornaments, and more. 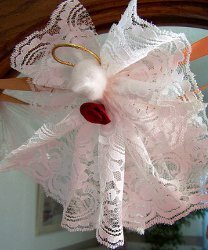 Check out this simple DIY angel tutorial and start dreaming up a list of lovely lacy homemade Christmas decorations. If you're going for an exquisite or vintage feel for your Christmas home decor, these lace angels are the perfect finishing touch. Colorful Sewn Angel (pg. 14) – This Christmas angel craft will melt hearts no matter where you place it this Christmas. A combination of vibrant fabrics and a darling face makes this angel a sweet addition to your tree or table. If you think this project looks complicated, don't fret. This tutorial has plenty of pictures to guide you along the way. Easy Angel Carolers (pg. 9) – You can almost hear the joyous melodies pouring out of this Christmas angel craft. This is another great project for crafters who like to use the materials they have on hand. You can make a whole choir of angels to decorate your mantel. Even loved ones who aren't experienced crafters will find this project easy, so set aside an afternoon with the family to create these singing angels. Download How to Make an Angel for Christmas: 7 Angel Crafts today! The spirit of the season is sure to be with you if you create some gorgeous new homemade Christmas decorations using the tutorials in How to Make an Angel for Christmas: 7 Angel Crafts. Be sure to subscribe to receive our newsletter, Crafty Christmas Ideas, too. Christmas is closing in, but there's still plenty of time to learn to make angelic homemade Christmas ornaments, homemade Christmas decorations, and more with these free tutorials and patterns.